Byta - Blog "Launched! Announcing Byta's Referral Program"
Word of mouth, the personal recommendation, has always held an outweighed role in music. We’ve all learnt about new artists, records, labels, met new people and found new jobs via our friends and Byta should be no different. People talk, and the talk about Byta has been good great though of course everyone should try something new for themselves. Byta’s referral program is our way of giving each and every person the chance to fully experience Byta, one service built for everyone working in music today. OK, so how does it work?! 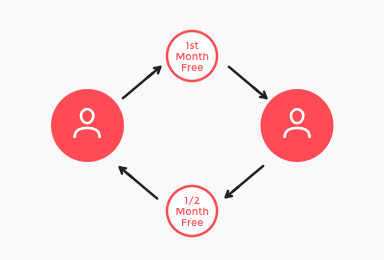 Everyone with a Freelancer Account has their own unique referral code, accessible from the ‘REFER A FRIEND’ button under Contacts. Anyone signing up or upgrading using a referral code will receive their first month free. The referrer will also receive one month’s discount of 50% for every person who signs up with their code (max 6 months). Need a code? Tweet us and we’ll sort you out.